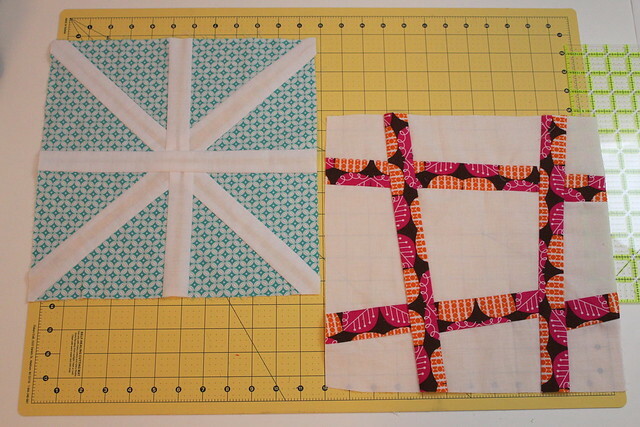 Posted in Sewing	by Kendra G.
or that one of my goals this year was to make a quilt. as well as what I’ve learned so far (which is a lot!). my friend Sally thought it’d be fun to do an online class to make a quilt. that you do two squares a month and by the end of the year, you have a quilt. especially considering I have NO IDEA what I’m doing. Sally, Lindsey, and I enrolled in the Craftsy Block of the Month 2012 class. so I could start working ahead, but ain’t no body got time for that. 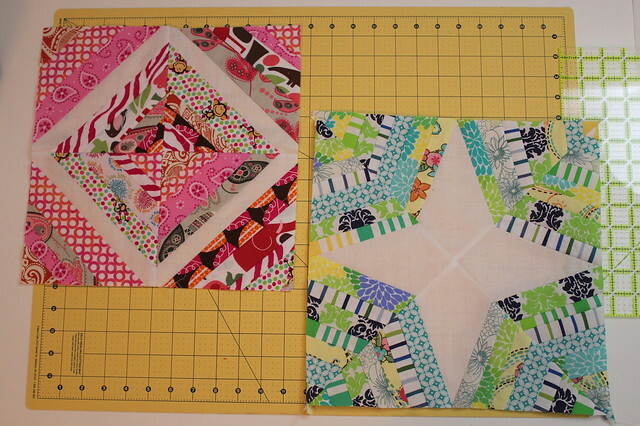 My first block was kind of rough (left). The second one was slightly better, but not by much. The biggest thing I learned this month was to press to the dark. Yes, I realize that seems so simple, but I didn’t know it. You can tell that I pressed to the white on the first block because my white fabric is sheer enough. I also learned that you are just using your iron to press, not actually ironing (back and forth). Overall, I wasn’t too upset with the blocks this month. I know they aren’t perfect, and that’s ok. 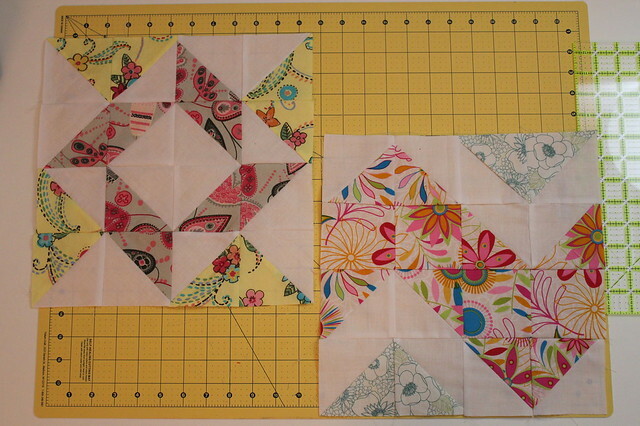 These blocks were a little more time consuming and complicated, but I liked doing them. The videos for the course are so easy to follow along with, which make it so much better. I love the chunky chevron on the right, it’s so fun! which of course, I did not. I also learned more about my machine this month. No joke, I realized that there is a handy little thread cutter actually ON THE MACHINE. Who knew? (Obviously, not me. Ha!). While these may have looked like the hardest blocks thus far, they actually were just the opposite! so I was just grabbing strands, sewing, and pressing. I was pretty impressed with how they turned out. and where you should be looking on your machine when you’re sewing. I’m excited about the quilt so far, and we’re only six squares in. so it’s going to be a wide array of colors and patterns, but I think that will make it fun. but I know it’s not going to be perfect, and I’m learning as we go. I definitely couldn’t do it without the Craftsy class and my crafty friends! Thanks Misha! I’m pretty sure that my machine also has a needle-threader, but I haven’t made it that far. Baby steps!